I have to start off this week by saying a massive thank you to Naomi, Melanie and Seanie of the Everyman Palace Theatre in Cork City. As part of Culture Night 2014 I got onto the backstage tour taken by Naomi and Seanie. It was their chance to shine and boy did they take it; seeing individuals so effervescent about their work with plenty of interesting stories and anecdotes was a joy in itself. Thank you so much for an informative, entertaining and thoroughly enjoyable tour. Here is one image I quickly took while in the wings off the main stage. 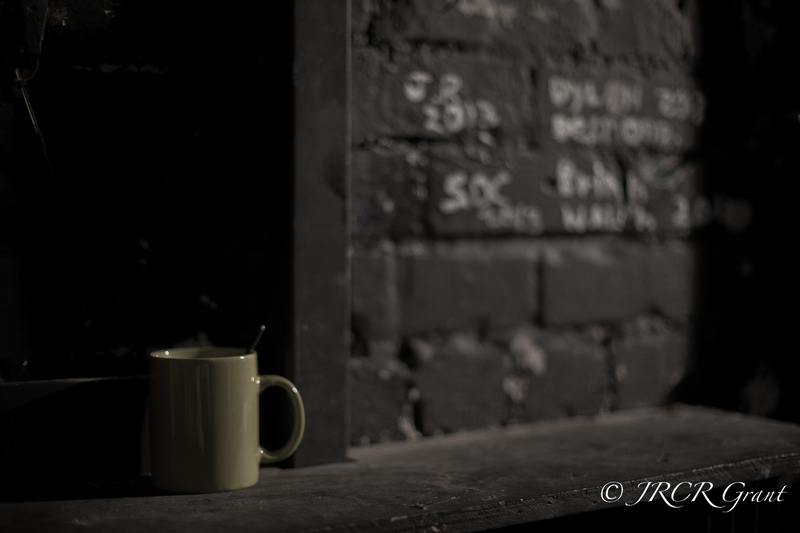 Might not be what one would expect but I spotted a vital piece of equipment for anyone having to use their voice…..
More will follow on the interesting graffiti that you can make out on the wall behind the mug – there will be plenty more coming from this fabulous little tour. love the solitude in this shot!